Ganglion cysts are very common masses (lumps) that sometimes grow on the hand and wrist. They cysts are generally found on the top of the wrist, on the palm side of the wrist, the end joint of a finger (mucous cysts), and at the base of a finger. Ganglion cysts usually come from nearby joints or tendon sheaths. There is no specific cause. These cysts can be painful, especially when they first appear or with constant or strenuous use of the hand. Ganglions often change in size and may disappear completely. These cysts are not malignant (cancerous). Treatment of ganglion cysts may require simply watching for any changes. However, if the cyst is painful, limits activity, or its appearance is unacceptable to the patient, other treatment may be recommended. This may include removing fluid from the cyst with a needle and/or wearing of a splint to keep the hand or wrist from moving. 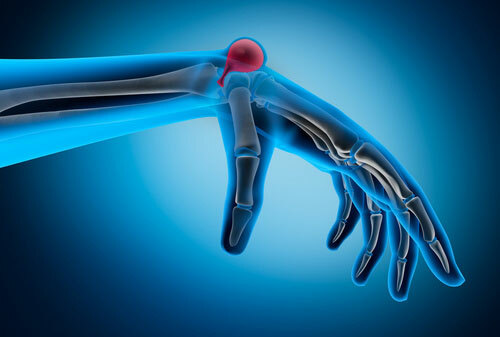 If these nonsurgical treatments fail, surgery to remove the cyst may be recommended by your hand surgeon.